" The sweetest dream to any party "
Serving Fresh Hot Mini Donuts right at your next occassion. Voted #1 on the 2014 Mitzvah Market Circuit! End your special night with Sweet Dreams take home favors!! Check out our Video below... Sweet Dreams are real when you have mini donuts at your event. 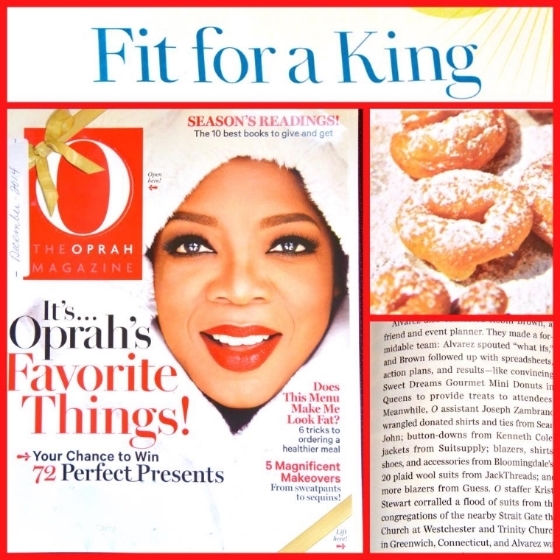 Sweet Dreams Mini Donuts mentioned in the December 2014 holiday issue of "O" Magazine for it's contributions to the Prom King Clothing for Life fundraising event.